Presenting ‘Flux’ – A breathtaking spectacle of choreographed colour where highly technical juggling is fused with dance and cutting edge technology. This completely unique double-act has been performed in 27 countries around the world. Beautiful patterns of light are traced through the air during the high-impact stage show as the balls and clubs change colour in perfect synchronisation with the upbeat musical soundtrack. 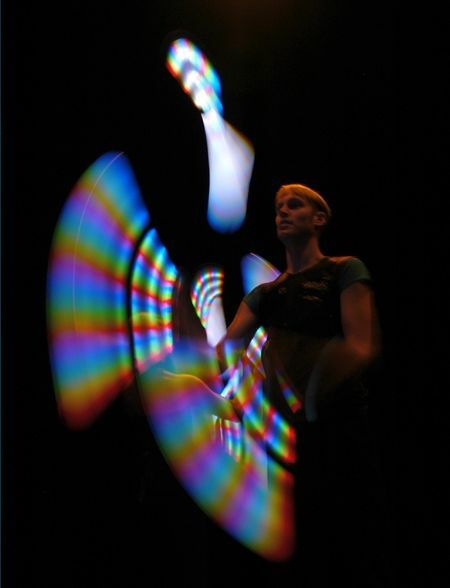 The props are programmed precisely to create a fantastic variety of colourful shapes and laser beams as they are thrown and manipulated by the accomplished jugglers. The Guardian listed Flux as a highlight of the 1997 Glastonbury Festival! The performance is suitable for corporate events, festivals, product launches, private parties, galas and variety theatre as well as having been adapted for nightclubs. ‘Flux’ is a 12 minute show. Contraband have been flying Flux all over the world! This year we have jetted them off to Madrid, Rome, Athens and Dubai! Poi ourselves and they are completely unique (patent pending). 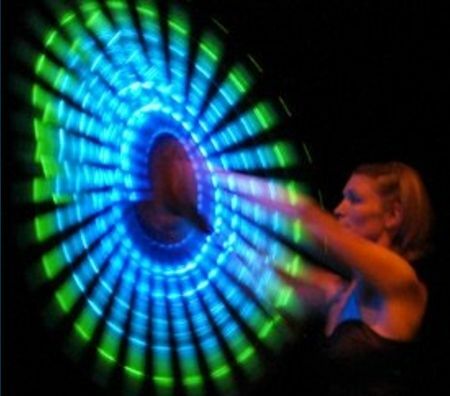 They can be precisely programmed to display text, graphics and logos as they are spun by the performers – this makes them perfect for custom shows. 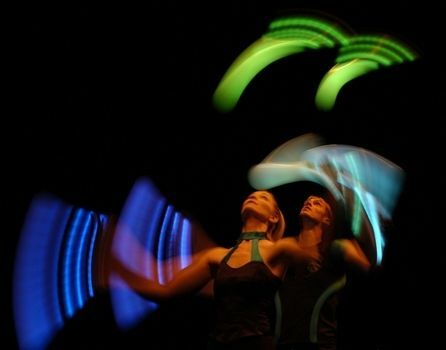 A typical branded performance would include a Pixel-Poi routine as the finale of the act, displaying numerous colourful patterns. As the music builds to the crescendo, the client’s choice of logo or text appears in the Pixel-Poi. The effect is completely breathtaking. 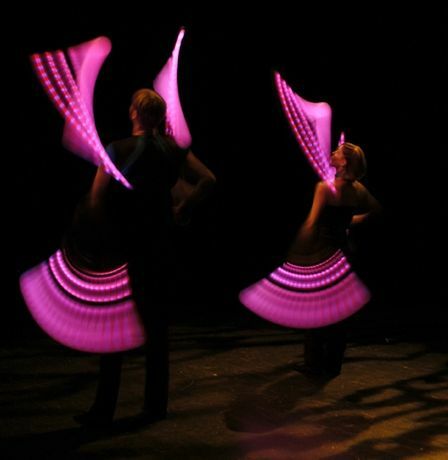 Second generation Pixel-Poi are incorporated in both acts: ‘Flux’ and ‘Kaleidoscope’. The displayed images now have a higher definition, dozens of colour shades and multiple words can be programmed to appear simultaneously. They typically request the artwork 10 days before the event for logo programming. Artwork is required in JPEG, PDF, GIF or EPS format. The displayed graphic will be a representation of the original logo rather than a verbatim copy. For text programming, up to 6 words will display most clearly. Everything went great…both kids and adults loved Flux who were very professional and smiled the whole way through. They were superb and went down really well with the client. They really helped bring the theme of the event to life. Our awards ceremony ran at half the anticipated time, so we had to rush the guys on fairly quickly, but they coped brilliantly with this (had we waited, we would have lost the audience to the bar area). Really great job. Thanks for your help and please pass on my thanks to them. There is nothing quite like this anywhere in the world. Flux have taken this specialized concept to a new dimension. The two jugglers, with both originality and imagination, transported the audience to their fantastic universe, for a highly colourful performance. Excellent. That was really excellent. But how did you get the colours to change? I didn’t know if it was me or the drink! 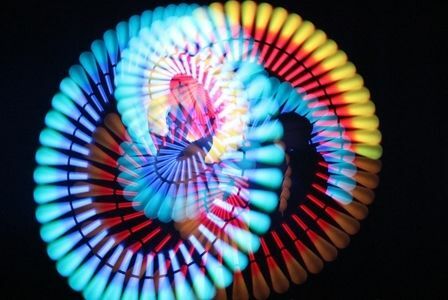 Flux – the coolest thing I’ve ever seen! Not much shuts me up, but I was speechless with fascination. The entire audience went nuts over the premier of the gorgeous new programmable gloclubs from Aerotech being expertly handled by the people Flux. Everyone wants these props. Although the technology should not blind people from the brilliant performance & choreography inputted by the human element. I just wanted to say thanks for all your help in our preparation for the Madrid job, and please pass on my huge thanks to Flux. They were an absolute joy to work with, and so flexible considering the restrictions of the room, and all their help in the awards presentations was really appreciated. I hope to be able to work with both them and you again. What can I say? You let your performance do all the talking….which was absolutely sensational!! I normally judge an act by the crowds reaction and they couldn’t get enough and wanted more. I don’t know whether you have considered it already but you should DEFINITELY enter ‘Britains Got Talent’, I can see you winning it!! The act was the defining moment of the night and I have had numerous phone calls asking me about the act and telling me how good you were!! Thanks so much and I appreciate all your efforts in making the night a success. Tenerife was great! Flux were just fantastic – never seen a show like it. It really did just blow everyone away. The client said it was the perfect ending to their conference and the other groups were very upset they didn’t see it!! We persuaded our client to use them for Sorrento but we couldn’t get them so we are having Kaleidoscope instead!! Hopefully it will go down just as well if not better!!! I was very impressed with Flux as were the guests at the event. The conference went very well and Flux fitted in very well with the scenery and theme we were trying to create.